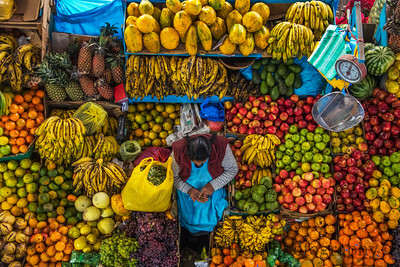 Market day in Urubamba. Beautiful, delicious, organic and oh so colorful. Always so much healthier here. Mornings in Chonta. Wake up to the sounds of roosters cackawwwing, the songbirds dancing across the flowers, the fresh, cool dry mountain air tickling your face, and the faint sounds of baaaaah as the sheep are shepherded to the fields for a day of grazing. 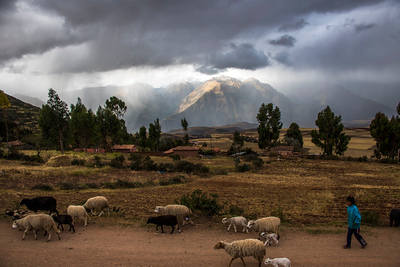 It's a daily scene in a small mountain community in the Peruvian Andes. Life is simple here. To many of us, it’s lackluster. It's difficult. It's connected. 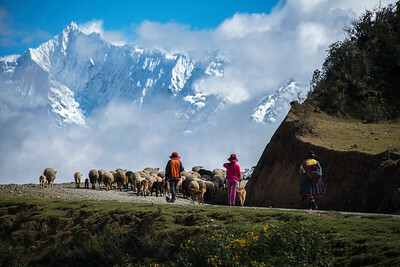 Here, a family heads out in the early morning taking the sheep to the pampa. The boy kicks his soccer ball, the girl plays with the dogs and mom chugs along stoically but with intention. Soon after I captured this photo, they sat down to eat soup...and before taking a bite, they brought it over to me and offered me some first. Whattt? A family that has very little offering what they have to a gringo riding his fancy mountain bike down the road. I happily obliged and enjoyed a 20 minute conversation with them about their animals, life and teaching a few English words to the children. Remarkable how generous and connected with the land these folks truly are. It's spiritual and special. We should all take note. Let your hopes, not your hurts, shape your future. This picture was taken in the small Amazon community of Asuncion de Quiquibey in Bolivia. This little girl's face intriguingly illustrates an arduous life, but her eyes reflect a pensive sense of hope. 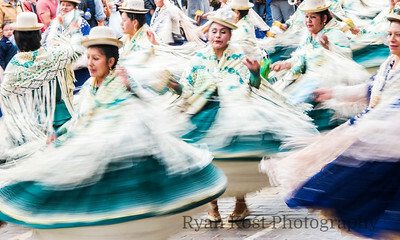 Weekends in Cusco are for dancing, music and color explosions in the streets. Slowing the shutter down a bit to capture some of the energy and motion. Vasillia, 83 years old. Grandmother of my second family member Carolina. A powerful soul who lives by herself in Chonta and takes care of everything on her own. 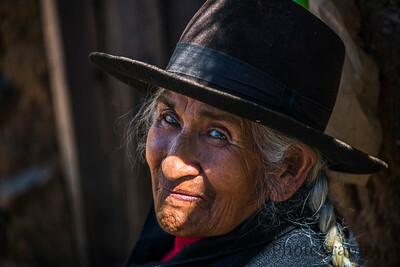 She still rides a horse to go check on the cows, takes the sheep to graze, maintains a garden, tends to the chickens, weaves beautiful tapestries, makes chicha (corn beer), cooks and is almost completely self sustainable. Remarkable. An encyclopedia of ancient traditions and true connection with the land. You don't always have to capture someone's face to tell their story. 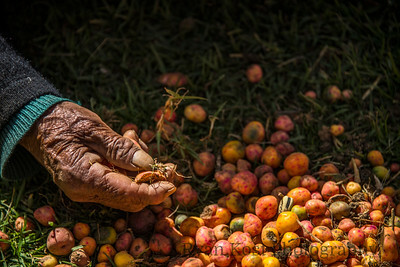 Hands reflect a life lived. Here, Vasillia organizes the various lisa potatoes into several piles. One for her soups. One for seeding and one for feeding the pigs. 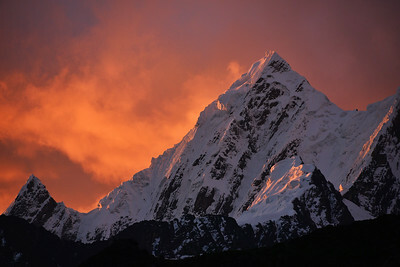 Evening light on Sarapo near the base camp for the famous book and movie Touching The Void. I am so so fortunate to call this my office. Never will I take it for granted. I hope it inspires everyone to slow down, get outside and just appreciate the natural beauty around. Delicate balance. 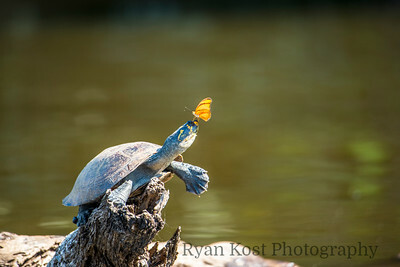 A butterfly perches on a tortoise's head to consume the rich minerals off of its face on Lake Sandoval in Madre Dios, Peru. Planet earth at its finest. 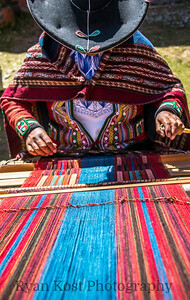 Demonstrating traditional weaving techniques in Chinchero at the Center for Textiles. Stunning work and mesmerizing work. Each weaving incorporates a story, utilizes natural dyes, completely hand woven and an incredible homage to a fascinating and intricate tradition. 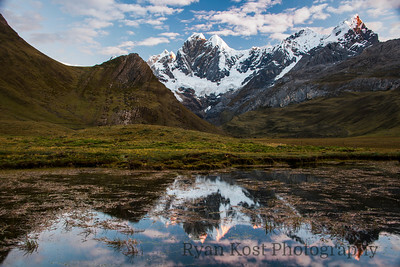 The last glow of the sun glances across the peaks in the Huayhuash as it sets behind the horizon. 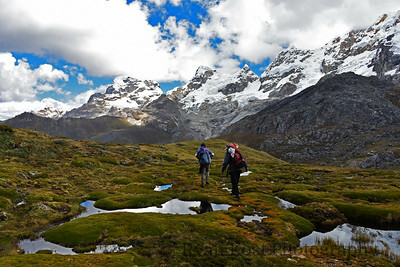 Daily business in Misminay, Peru. Taking the sheep up the mountain to graze. Life is slower, quieter, more difficult yet intrinsically connected with the land...and that is pretty damn special. Life is too complex to ever pretend to capture in a singular frame but when trying to catch a glimpse of the story, I really try to take my time, observe and FEEL before clicking the shutter. I focus in on the subtleties, behaviors and what draws me in. It's one thing to look into someone else's eyes, but it's all the more powerful when you reach for the soul and connect in a more poignant way. 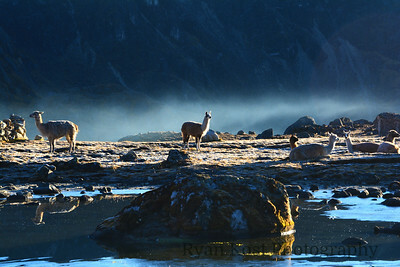 Photo taken in Cusco while wandering the streets. 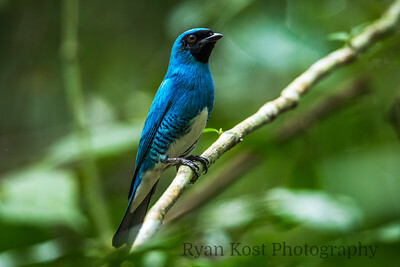 A Swallow Tanager perched and alert along the Madre Dios River in the Peruvian Rainforest. The males shiny turquoise coat seems like it would attract the females when breeding but actually it's the other way around. The female approaches the male with a fine curtsey and bobbing motion. In return, the male will also curtsey. The female then quickly flies off, and if the male follows, then they will breed and become a pair. 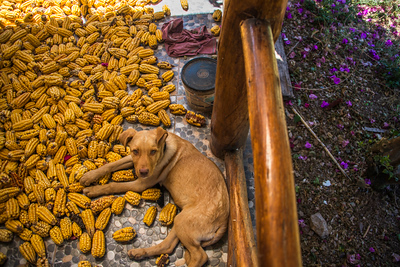 Campeon finding a nice spot for a siesta at the house in Limatambo among the maiz and fallen bougainvillea leaves. "Wrinkles should merely indicate where smiles have been." Mark Twain is one of my favorites; but he falls short here. Wrinkles indicate a life lived. They are products of smiles, tears, anger, hardship, grief, joy, love and the range of emotions only gained through experience. This woman forever captivates my spirit. 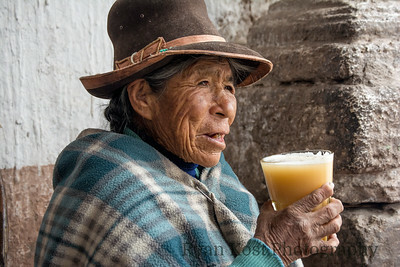 She was sitting in Amaru, Peru drinking homemade chicha (corn beer). By best buddy Yieber and I approached her and started chatting. Quechua being Yieber's first language provided us direct insight and instant connection. 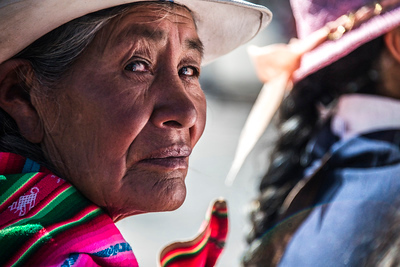 She spoke of a arduous life lived at high altitude, working in the fields, being a mother, a grandmother and just embodying what the human experience is for so many campesinas living in the high Andes. She even scolded me for not taking the glass of chicha with two hands and informed me, I wouldn't be having many babies if I continued accepting with one hand. Her countenance explains it all. Authentic. Straight forward. No complaints about being poor or living such a difficult, physical life....just a matter of fact attitude with some sagely advice intermixed. Here I sit, aware of my privilege. Consciously grateful to be able to travel to such places and hear other's experiences. The takeaway... infinite. I crave these interactions. Profound gratitude resides in my very core. I have fostered incredibly special relationships with people around the world who grew up very different than I did. They have shaped my perspectives and left an indelible sense of curiosity and compassion for the human spirit. I look up to those who have persevered through true adversity with a sense of dignity and generosity that is utterly remarkable and admirable. Those wrinkle aren't solely evidence of myriad smiles. They are boundless emotions worn on a face of a life lived. I hope one day, I'll have as many wrinkles. 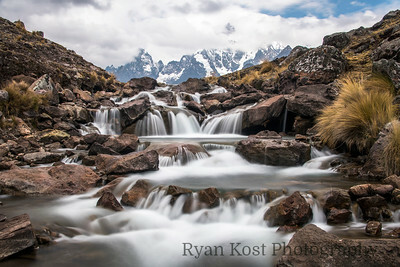 Cascading glaciel streams tumble in the community of Pacchanta at the base of Apu Ausangate, the highest and most sacred mountain in the Cusco region. A very special place for me that always grounds me and provides space to really offer gratitude for a place that has given me so much. Weekends in Cusco are always magical. The streets are shut down to cars and dancing and music ensues. A way to celebrate, remember and share culture. 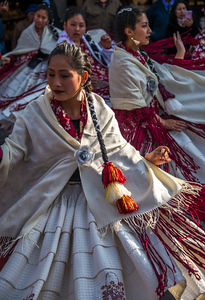 This dance comes is called the Morenada and comes from Bolivia. It's believed to stem from a mixture of African and indigenous roots. Similar to the United States, Africans were enslaved in the silver mines in Potosi. These dances were created as forms of expression and to sustain through incredible hardship. 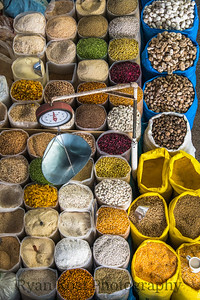 One of best ways to experience a place....visit the market. 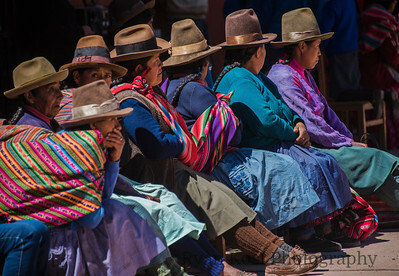 Urubamba market in the Sacred Valley. Nature's hopscotch. Take it all in stride..until you misstep. First one to sink knee deep into the mud and water loses. Well, I lost...and it wasn't all bad. We all had a good laugh, and were serenaded by the squishy shoe orchestra for the next few hours...oh, and those mesmerizing views....my reason for the blunder. Time in the mountains with good company has always brought out the silliest of games. It's one of my favorite things. Your brain stops stressing and your inner child comes out. Language and cultural differences fade away. You skip rocks, you see who can last longer in a frigid lake, you see who has the best pterodactyl call, you race dried out llama poo down a stream, you scan to be the first one to spot a condor...and you laugh...you connect...with yourself, the land and others. There really isn't a better feeling!